The Tennant model S10 sweeper is back by popular demand. For over a decade Tennant sold one of the best-selling industrial sweepers called the model 186. Maintenance people with the toughest applications knew that the 186 would last in the most severe environments. Tennant replaced this model with a new design and after a few years customers and Tennant sales reps were clamoring to bring back this nearly indestructible model. The 186 was reborn as the new Tennant Model S10 with a few handy improvements. The heavy steel bumper wrapping the entire machine protects vital components like the side broom and hopper. Let’s face it many of these sweepers take a beating when used every day in heavy industrial applications. The S10 can take a hit and keep on sweeping. Its unique floating hopper system allows it to navigate its way over very rough surfaces and larger objects. Take an S10 for a test sweep in your facility. You will see that this machine can sweep up nearly everything without creating a dust cloud. Those pictures you see on the brochure are real. 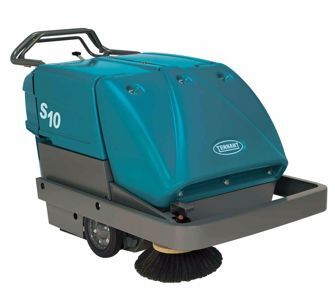 The Tennant S10 will sweep up fine dust, chunks of wood and metal, construction debris, and many other things found in industrial facilities. The Tennant S10 has the best productivity rating in its class. With a 36” sweep path operators can clean about 30,000 square feet per hour. The large 150 pound capacity hopper will keep them sweeping without have to stop to dump. The on-board charger allows it to be parked anywhere and charge, no outlet required.